The book of Revelation encourages followers of Jesus Christ to remain faithful in the midst of persecution and trials. This book is also known as the Apocalypse, which in Greek means a revelation, uncovering, or unveiling of that which is hidden. As “the Revelation of Jesus Christ” (Revelation 1:1), this book is both an unveiling of the Lord Jesus Christ and an uncovering of Jesus Christ’s authority and power and His role in the Father’s plan of salvation. The book also reveals much important information about the events leading up to the Second Coming and the Millennium. Prayerful study of this book can bring you a deeper understanding of the resurrected and glorified Son of God and His dealings with God’s children throughout the ages of earth’s history, particularly in the last days. The Prophet Joseph Smith (1805–44) said: “The book of Revelation is one of the plainest books God ever caused to be written” (in History of the Church, 5:342). Though it is rich with imagery and symbols that are not always easy for readers in modern times to understand, the themes of the book are simple and inspiring. “The message of Revelation is the same as that of all scripture: there will be an eventual triumph on this earth of God over the devil; a permanent victory of good over evil, of the Saints over their persecutors, of the kingdom of God over the kingdoms of men and of Satan” (Bible Dictionary, “Revelation of John”). Thus, the book of Revelation extends a message of hope to all the faithful. The book’s author identifies himself as John (see Revelation 1:1, 4, 9; 22:8), understood to be the son of Zebedee and the beloved disciple of Jesus Christ (see Matthew 4:21–22). Latter-day revelation affirms that John the Beloved is the author (see 1 Nephi 14:18–27; Ether 4:16; D&C 77:1–2; Bible Dictionary, “John”). When and where was Revelation written? Revelation was written at a time when Christians were facing false teachings, apathy, and severe persecution (see Revelation 1:9; 2:4, 10, 14–15; 3:16; 6:9). Most likely this persecution came at the hands of Roman officials in the later years of the reign of Domitian (A.D. 81–96). Domitian revived the practice of emperor worship and exiled or executed those who did not worship gods approved by the state. Ancient sources indicate that Christians and Jews were persecuted under his reign. John wrote from the island of Patmos, where according to tradition, he had been exiled by Roman officials “for the word of God, and for the testimony of Jesus Christ” (Revelation 1:9). To whom was Revelation written and why? John wrote a message of hope and encouragement to those in his day who still adhered to the teachings of Jesus Christ (see Revelation 1:4, 11). The first three chapters of the book of Revelation were specifically addressed to seven branches of the Church in Asia Minor (see Revelation 1:4, 11; 2–3). It is unclear why these particular churches were singled out. While other branches of the Church had been established in Asia (such as at Pisidian Antioch), these seven may represent the Church as a whole (the number seven being symbolic of completeness). 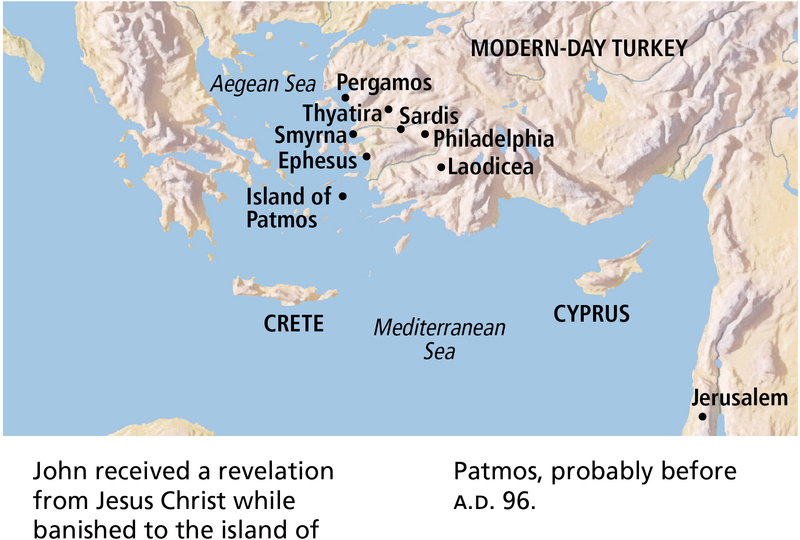 Historical sources indicate that John lived at Ephesus near the close of the first century, so he would have had close connections with the seven churches before his exile to Patmos, and he would have visited them as he ministered in Asia Minor. They may also have been among only a few branches that were still faithful and had not succumbed to apostasy and persecution. The faithful members of the Church lived in times of intense persecution, with all the Apostles gone except John, who was now in exile, and with many factions and problems in the Church. As a result, the Saints were in great need of the encouraging message found in Revelation. John reassured them that God was in control, Jesus Christ’s ultimate triumph over evil would be complete, and the hopes of all Christians would ultimately be realized. What are some distinctive features of Revelation? The structure of the book is suggested in Revelation 1:19. John wrote about the things he had seen﻿—the vision of Jesus Christ (see Revelation 1), “the things which are” (conditions in the Church of his day; see Revelation 2–3), and “the things which shall be hereafter” (see Revelation 4–22). The book of Revelation, understood with the aid of latter-day revelation, presents an inspired overview of the history of the world, concentrating particularly on the time preceding the Second Coming of Jesus Christ and the great millennial era of peace. The book contains promises to faithful Saints who overcome evil (see Revelation 2–3). It contains numerous symbolic images, including dragons and beasts. It contains one of the few scriptural passages describing the premortal war in heaven (see Revelation 12:7–11). Its major themes include Jesus Christ’s role in carrying out God’s plan, the hand of God in earth’s history, the Second Coming of Jesus Christ and the destruction of evil, the spiritual protection promised to the righteous in the last days, the Millennium, and the promise that the earth will eventually become celestial. In 1 Nephi 14:24–29, we learn that about 600 years before John’s birth, the prophet Nephi saw a vision similar to John’s and learned John’s name. The Lord instructed both Nephi and John to write only a portion of their visions﻿—Nephi wrote of the first coming of Christ and some of the events of the last days, and John wrote of Christ’s Second Coming, the Millennium, and the completion of God’s work on the earth. Other prophets have also seen similar events in vision (see Ether 3:25–28; Moses 7:59–67). John saw a vision of Jesus Christ. He wrote individual messages to the seven churches in Asia; these messages included praise, admonitions, and promises to the faithful Saints in each branch. John saw a vision of God enthroned in the celestial kingdom, the Lamb of God, and a book sealed with seven seals. John saw visions in connection with the opening of each of the seven seals. Those who will receive God’s protection in the last days are those who have the seal of God in their foreheads. John saw wars, plagues, and many other latter-day events that will precede the Lord’s Second Coming. John saw a vision of the premortal war in heaven and the war’s continuation on the earth. He taught that evil forces seek to destroy God’s kingdom on earth. The gospel will be restored in the last days by angelic ministry. The righteous will be gathered out from Babylon, which represents the wickedness of the world, and preparations will be made for the battle of Armageddon. Spiritual Babylon will be spread throughout the earth. After the righteous Saints are gathered, Babylon will fall and be mourned by her supporters. The righteous will be invited to the marriage supper of the Lamb of God. Satan will be bound, the Millennium will begin, and Christ will reign personally on the earth. The dead will be judged. The earth will attain its celestial glory. 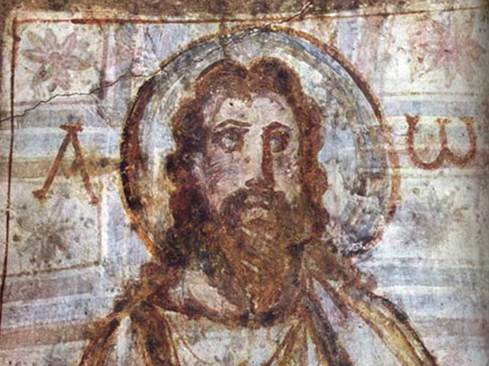 The Greek letters Alpha and Omega (see Revelation 1:8, 11) appear on either side of this painting of Jesus Christ from the catacomb of Commodilla in Rome. The painting was created in the fourth century A.D.
A short distance off the coast of present-day Turkey lies a tiny island called Patmos, where just over 1,900 years ago, the Lord Jesus Christ appeared to John the Beloved and instructed him to write an account of the visions and revelations he was about to be given (see Revelation 1:10–16, 19). In Revelation 1–3 John introduced themes that run throughout the book. Revelation 1 describes a vision of the Lord Jesus Christ, unveiling aspects of the Savior’s power and eternal mission, including the reassuring truth that the Lord labors among and with His faithful servants. In Revelation 2–3, John’s letters to seven branches of the Church convey counsel and correction from the Lord to help His followers receive the blessings of exaltation. The messages in these chapters showed the Saints in John’s day that Christ will help His followers overcome even as He overcame, and these messages teach the same thing to us today. The Joseph Smith Translation changes Revelation 1:1 to clarify that the book was indeed a revelation given to John by the Savior, Jesus Christ: “The Revelation of John, a servant of God, which was given unto him of Jesus Christ” (in the Bible appendix). “The title of the book in Greek is Apocalypsis, from which we get its other common name, the Apocalypse. Apocalypsis is formed from two Greek words﻿—apo, a preposition denoting separation or removal, and kalypto, a verb meaning to cover, hide, or veil. Apocalypsis, then, literally means removal of the veil or covering. Hence its title in English, the book of Revelation (or the uncovering or unveiling). “If we diligently use the keys that the Lord has given us to interpret the book of Revelation, it can truly become a book of revelation for us” (“Seeing the Book of Revelation as a Book of Revelation,” Ensign, Dec. 1987, 46, 52). Revelation 1:1 states that the revelation from God was “signified” by an angel unto “his servant John.” The word “signified” is the English translation of the Greek word eseemanen, which can mean to indicate something by a sign, mark, or token. The book of Revelation contains several “blessed is” statements (see Revelation 1:3; 14:13; 16:15; 19:9; 20:6; 22:7, 14). These are similar to the Beatitudes found in Matthew 5:3–11. The progression of actions described in Revelation 1:3﻿—read, hear, and keep﻿—shows that besides reading or hearing the book of Revelation (or any other book of scripture), we must also “keep those things which are written therein.” By doing all of these things, we receive the promised blessings. The Joseph Smith Translation of verse 3 adds the word understand to this sequence, showing the importance of understanding the teachings of this book (see the Bible appendix). Revelation 1:3 includes the phrase “for the time is at hand.” The Joseph Smith Translation of verse 3 clarifies this concept: “For the time of the coming of the Lord draweth nigh” (in the Bible appendix). When John said that he was shown “things which must shortly come to pass” (Revelation 1:1), the Second Coming was one of the things he referred to. As with all things, the Second Coming will occur in accordance with the Lord’s timetable (see 2 Peter 3:8). Revelation 1:5–6 shows that the blessing of being made “kings and priests unto God” comes through applying the Atonement of Jesus Christ in our lives. Elder Bruce R. McConkie (1915–85) of the Quorum of the Twelve Apostles taught the following about the phrase “washed us from our sins in his own blood” (Revelation 1:5): “The blood of Christ alone cleanseth repentant souls from sin. ‘No unclean thing can enter’ into the kingdom of God, are the words of Christ, the first begotten from the dead; and none shall gain an inheritance there, ‘save it be those who have washed their garments in my blood, because of their faith, and the repentance of all their sins, and their faithfulness unto the end.’ (3 Ne. 27:19. )” ( Doctrinal New Testament Commentary, 3 vols. [1966–73], 3:436). President Joseph F. Smith (1838–1918) taught: “The object of our earthly existence is that we may have a fulness of joy, and that we may become the sons and daughters of God, in the fullest sense of the word, being heirs of God and joint heirs with Jesus Christ [see Romans 8:14–17], to be kings and priests unto God, to inherit glory, dominion, exaltation, thrones and every power and attribute developed and possessed by our Heavenly Father. This is the object of our being on this earth. In order to attain unto this exalted position, it is necessary that we go through this mortal experience, or probation, by which we may prove ourselves worthy, through the aid of our elder brother Jesus” ( Teachings of Presidents of the Church: Joseph F. Smith , 150; see Exodus 19:5–6; 1 Peter 2:9). The Prophet Joseph Smith quoted Revelation 1:6 and focused on the phrase “hath made us kings and priests unto God and his Father,” giving this explanation of its meaning: “God the Father of Jesus Christ had a Father. … Paul says that which is earthly is in the likeness of that which is heavenly. Hence if Jesus had a Father, can we not believe that He had a Father also?” (in History of the Church, 6:476). The Prophet Joseph had earlier taught, “God Himself was once as we are now, and is an exalted man, and sits enthroned in yonder heavens!” ( Teachings of Presidents of the Church: Joseph Smith , 40; see Doctrinal New Testament Commentary, 3:436–37). Of the words and phrases used in these verses to describe Jesus Christ, which ones are the most meaningful to you? How do these verses work together to reveal the Savior’s identity, character, and eternal mission? The message of Joseph Smith Translation, Revelation 1:5–7 conveys comfort and hope. These verses describe the Savior’s Second Coming: “Therefore, I, John, the faithful witness bear record of the things which were delivered me of the angel, and from Jesus Christ, the first begotten of the dead, and the Prince of the kings of the earth. For behold, he cometh in the clouds with ten thousands of his saints in the kingdom, clothed with the glory of his Father. And every eye shall see him; and they who pierced him, and all kindreds of the earth shall wail because of him. Even so, Amen” (in the Bible appendix). These teachings help us understand that the many faithful Saints who died at the hands of persecutors did not die in vain and will be rewarded for their righteousness (see 1 Thessalonians 4:16–17; D&C 88:96–98; 101:15). “These letters from the Greek suggest the universal role of Jesus from the beginning of the world to its end. But he ought to be Alpha and Omega in the particular as well﻿—our personal beginning and our individual end” (“Whom Say Ye That I Am?” Ensign, Sept. 1974, 6–7). The title “Almighty” is the English translation of the Greek word Pantokrator, which suggests one who rules and regulates all things. One theme of the book of Revelation is that even though God’s people in all ages face persecution and trouble, God does indeed govern all things and will one day put an end to all evil. Several images from the first chapters of Revelation reinforce the Savior’s role as “the Almighty” (Revelation 1:8): His word is represented as “a sharp twoedged sword” (Revelation 1:16), He holds “the keys of hell and of death” (Revelation 1:18), and He knows people’s works (see Revelation 2:2, 9, 13, 19). Revelation 1:12, 20. What Is the Symbolism of the Seven Candlesticks? The imagery of the “seven golden candlesticks” (Revelation 1:12, 20) recalls the seven-branched menorah found in the Jerusalem temple. These candlesticks represented the seven churches. They were established to give light to the world, just as the Savior had commanded His disciples to do (see Matthew 5:15–16). Elder Bruce R. McConkie noted: “Candlesticks carry light; they do not create it. Their function is to make it available, not to bring it into being. So by using seven candlesticks to portray the seven churches to whom John is now to give counsel, the Lord is showing that his congregations on earth are to carry his light to the world. Christ is the Light of the world. (John 8:12.) ‘Hold up your light that it may shine unto the world. Behold I am the light which ye shall hold up﻿—that which ye have seen me do.’ (3 Ne. 18:24; Matt. 5:14–16. )” ( Doctrinal New Testament Commentary, 3:442). What do the symbolic descriptions of Jesus Christ in these verses teach about His attributes and His work? Which of these descriptions are most meaningful to you? In John’s vision, he saw Jesus Christ “in the midst of the seven candlesticks,” showing symbolically that He was with or among the seven ancient churches (Revelation 1:13). During His mortal ministry, Jesus promised, “Where two or three are gathered together in my name, there am I in the midst of them” (Matthew 18:20). The assurance that Jesus Christ is with His Saints and watches over them is also found in modern scripture, such as in Doctrine and Covenants 38:7: “Verily, verily, I say unto you that mine eyes are upon you. I am in your midst and ye cannot see me.” Such assurances have also been reiterated by modern prophets and apostles. President Henry B. Eyring of the First Presidency testified that the Lord “watches with us. He who sees all things, whose love is endless, and who never sleeps﻿—He watches with us” (“Watch with Me,” Ensign, May 2001, 39). Revelation 1:16, 20. Who Were the Seven Angels of the Seven Churches? The Joseph Smith Translation changes the word “angels” to “servants” in Revelation 1:20 (footnote b) and in the opening verse of each of the seven letters to the churches in Asia (see Revelation 2:1, footnote a; 3:1, footnote a). Thus, the seven stars represent the presiding officers who were then leading the seven churches. The following chart gives an overview of the pattern used to address the seven churches. (See the map at the beginning of this chapter for the location of the churches.) Each letter first addresses the leader of the church in the area and uses symbolic terms to identify Jesus Christ. It next conveys the Lord’s words of praise and commendation and His words of correction and warning. Then, promises are given to those who overcome through faith in Jesus Christ. These promises are related to exaltation and eternal life, and they contain rich temple symbolism. Largest city in Asia Minor. Famous for its magnificent temple of Artemis—one of the seven wonders of the ancient world. Early center of emperor worship. Major shipping port and trade center. Polycarp, bishop of Smyrna, was martyred there. Provincial center for emperor worship. Three temples dedicated to emperor worship. Library housed over 200,000 scrolls. Famous for wool dyeing. A military city. Principal deity was Tyrimnas (sun god), who was often portrayed with military prowess. Crossroads of five major highways. Reputation for great wealth and low moral standards. Called the “gateway to the East.” Famous for wine production. Center for worship of Bacchus, god of wine. Relatively unimportant city in its day. Wealthy commercial and banking center. Hot springs at Hierapolis sent warm water flowing to Laodicea. Medical school produced an eye salve. To read more about false apostles who were teaching in Ephesus, see Acts 20:17–18, 28–30. Paul described these false apostles and others like them as “grievous wolves” (Acts 20:29) and as men who would arise from among the Saints and speak “perverse things, to draw away disciples after them” (Acts 20:30; see also 2 Corinthians 11:13–14, 26; 1 John 4:1–3). The Nicolaitans were “an Antinomian sect in Asia Minor that claimed license for sensual sin” (Bible Dictionary, “Nicolaitans”). Antinomians were permissive Christians who claimed that the grace of God freed them from having to obey commandments. The Lord commended some Saints for rejecting the deeds of the Nicolaitans, while chastising other Saints for holding to the doctrine of the Nicolaitans (see Revelation 2:6, 15). Elder Bruce R. McConkie explained that the Nicolaitans referred to in the book of Revelation were “members of the Church who were trying to maintain their church standing while continuing to live after the manner of the world” ( Doctrinal New Testament Commentary, 3:446). Depiction of the tree of life, by Jerry Thompson. The Lord told the church in Ephesus: “To him that overcometh will I give to eat of the tree of life, which is in the midst of the paradise of God” (Revelation 2:7; see also 1 Nephi 8:10–12; Alma 5:34; 32:39–42). The tree of life was planted in the Garden of Eden, where Adam and Eve walked and talked with God. After the Fall they were separated from the tree of life (see Genesis 3:22–24). Because of the Atonement of Jesus Christ, the effects of the Fall will be overcome. All people will be resurrected, thereby overcoming death, and the faithful will inherit eternal life. The angel described the reward of the faithful in this way: “To him that overcometh will I give to eat of the tree of life” (Revelation 2:7). The term “overcometh” comes from the Greek verb nikaō, meaning “to be victorious.” In a vision similar to John’s, the prophet Nephi also saw the tree of life (see 1 Nephi 11:8–9, 21–23). To read more about partaking of the tree of life, see Revelation 22:2 and the commentary for Revelation 21:2–27; 22:1–5. This statue depicts Polycarp, bishop of Smyrna, who suffered martyrdom in A.D. 155. The Lord told the Saints in Smyrna that some of them would be imprisoned and would have temptations and trials, but they should not fear. If they were “faithful unto death,” He would give them “a crown of life” (Revelation 2:10). A fulfillment of the Lord’s words can be seen in the life of Polycarp, a bishop of the church in Smyrna, who lived from A.D. 69 to 155. Polycarp was a disciple of John and one of the last surviving Church leaders who had personally heard the teachings of an Apostle and eyewitness of Jesus Christ. Because he would not renounce his faith, he was burned at the stake as a martyr. When he was told that he could avoid martyrdom by worshipping the Roman emperor and cursing Christ, Polycarp replied: “For eighty and six years have I been [Christ’s] servant, and he has done me no wrong, and how can I blaspheme my King that saved me?” ( The Apostolic Fathers, vol. 2, trans. Kirsopp Lake, Loeb Classical Library [Cambridge: Harvard University Press, 1913], 325). Later Christians remembered Polycarp for the courage and faith he showed in the face of great adversity. For more information on “holding fast” to the name of Christ, see the commentary for Revelation 2:13. Revelation 2:11 teaches that the faithful “shall not be hurt of the second death.” The wicked, however, “shall have their part in the lake which burneth with fire and brimstone: which is the second death” (Revelation 21:8). While serving in the Presidency of the Seventy, Elder Earl C. Tingey explained that “the second death is spiritual. It is separation from God’s presence” (“The Great Plan of Happiness,” Ensign or Liahona, May 2006, 73). In one sense, we all experienced a spiritual death when we left God’s presence to come to earth. This initial separation, however, is not the “second death” mentioned in Revelation 2:11. Through the Atonement of Jesus Christ, all of God’s children will overcome this initial spiritual death and be brought back to God’s presence to be judged (see Helaman 14:16–17), after which most people will inherit a kingdom of glory. A second spiritual death will be pronounced at the Day of Judgment upon those who refuse to repent of their sins and who willfully rebel against the light and truth of the gospel, as Satan did (see D&C 29:44–45; Guide to the Scriptures, “Death, Spiritual”; scriptures.lds.org). They will be forever separated from God and will be sons of perdition (see D&C 76:30–37, 44). Revelation 2:12–13. What Was “Satan’s Seat”? “‘Under Augustus a temple was built at Pergamum [Pergamos], probably 29 B.C., and dedicated to Rome and Augustus, and Pergamum became the center of the imperial worship and “Satan’s throne” [seat].’ [J. R. Dummelow, ed., The One Volume Bible Commentary (1936), 1075. ]” ( Doctrinal New Testament Commentary, 3:449–50). Model of an ancient altar at Pergamos dedicated to the god Zeus, from Pergamon Museum in Berlin, Germany. The Lord told the Saints at Pergamos, “I know … where thou dwellest, even where Satan’s seat is” (Revelation 2:13). Many scholars believe that “Satan’s seat” referred to the altar at Pergamos. Christians who were sentenced by Roman officials to prison or death could sometimes save themselves by cursing Christ and worshipping the emperor instead. John recorded the Lord’s praise for the Saints in Pergamos for “holding fast” His name, even under threat of death (Revelation 2:13; see also Revelation 2:25; 3:3, 11). A recurring phrase in Revelation 2–3 is the admonition to “hold fast” to the truth (see Revelation 2:13, 25; 3:3, 11). President M. Russell Ballard of the Quorum of the Twelve Apostles explained that to “hold fast” to the truth, found in the word of God, means to “hearken to it, follow the principles taught therein, and cling to those principles as though our very lives depended on it﻿—which, if we are speaking of spiritual life, is literally true” (“Be Strong in the Lord,” Ensign, July 2004, 10). Balaam was an Old Testament prophet, whose actions are recorded in Numbers 22–24; 31:16. He appeared at first to be true to the Lord and His people, repeatedly refusing Balak’s request to curse Israel. Nevertheless, Balaam eventually succumbed to Balak’s offer of riches and taught Balak how to cause the army of Israel to weaken themselves through sexual sin and idolatry (see Numbers 25:1–5; 31:13–16). The plan included having Moabite women seduce the men of Israel and persuade them to offer sacrifices to heathen gods, thus destroying them spiritually. The Angel Appearing to Balaam, by Paul Gustave Doré. The doctrine of Balaam mentioned in Revelation 2:14 refers to the account of Balaam and the children of Israel found in the book of Numbers. Elder Bruce R. McConkie defined the doctrine of Balaam as being willing “to divine [prophesy] for hire; to give counsel contrary to the divine will; to pervert the right way of the Lord﻿—all with a view to gaining wealth and the honors of men. In effect, to preach for money, or to gain personal power and influence. In the very nature of things such a course is a perversion of the right way of the Lord. See 2 Pet. 2:10–22” ( Doctrinal New Testament Commentary, 3:450). The Lord provided life-sustaining manna for the children of Israel to eat during their 40-year sojourn in the wilderness (see Exodus 16:15, 35). Just as the manna sustained physical life, Jesus Christ is the “bread of life” that sustains spiritual life (John 6:35, 48). The “hidden manna” mentioned in Revelation 2:17 refers to Jesus Christ. Jesus is “hidden” from the wicked. But, as He taught in John 6, those who symbolically partake of His flesh will receive everlasting life (see John 6:47–58). Revelation 2:17 states this instruction to the churches: “To him that overcometh will I give to eat of the hidden manna, and will give him a white stone, and in the stone a new name.” For revealed insight into the meaning of the white stone, see Doctrine and Covenants 130:8–11. The word “reins” literally means “kidneys.” To the Hebrews, the word signified strength and vigor. In Greek the word implies desires and thoughts. The phrase “searcheth the reins and hearts” is an idiom, meaning that the Lord knows all things about the inner man. It is because of this perfect understanding that the Lord is able to “give unto every one of you according to your works” (Revelation 2:23; see also D&C 137:9). “The morning star” is a symbol of Jesus Christ (Revelation 2:28; 22:16). The promise of “the morning star” is given to him “that overcometh, and keepeth my works unto the end” (Revelation 2:26). It may be the promise of the Second Comforter, of which the Prophet Joseph Smith taught, “When any man obtains this [Second] Comforter, he will have the personage of Jesus Christ to attend him, or appear unto him from time to time, and even He will manifest the Father unto him, and they will take up their abode with him, and the visions of the heavens will be opened unto him, and the Lord will teach him face to face” (in History of the Church, 3:381). Revelation 3:7 contains a quotation from the prophet Isaiah: “And the key of the house of David will I lay upon his shoulder; so he shall open, and none shall shut; and he shall shut, and none shall open” (Isaiah 22:22). Isaiah was speaking about one of King David’s chief ministers, Eliakim, who was given the keys to open locked doors of the holy temple. These keys can be seen as a symbol of power and governing authority. In Revelation 3:7, Jesus referred to Himself as the one who holds “the key of David,” meaning that He holds the key to the heavenly temple and ultimately to life in the presence of God. The Lord declared that He will write “the name of my God” upon those who overcome (Revelation 3:12). A name can suggest many ideas about a person, including the person’s identity, reputation, family, associations, attributes, role, and abilities. Elder Bruce R. McConkie wrote about one of the meanings of this statement: “God’s name is God. To have his name written on a person is to identify that person as a god. … Those who gain eternal life become gods! [see D&C 132:19–20]” ( Doctrinal New Testament Commentary, 3:458). To read more about what it means to have the name of God written on us, see the commentaries for Revelation 14:1–5 and for Revelation 22:4. In Hebrew and Greek the word “amen” means truly, certainly, or faithfully. In Revelation 3:14, Christ’s faithfulness and truthfulness as the great “Amen” are presented as a contrast to the lukewarm attitudes of the Laodiceans (see also Revelation 3:15–16). When uttered at the conclusion of a prayer or a discourse, “amen” is a way of solemnly affirming what has been said or expressing agreement with it. Elder Bruce R. McConkie taught that the Savior’s title “Amen” also shows “that it is in and through him that the seal of divine affirmation is placed on all the promises of the Father” ( Mormon Doctrine, 2nd ed. , 32). “The book of Revelation declares: ‘I know thy works, that thou art neither cold nor hot: I would thou wert cold or hot. “Each of us has to face the matter﻿—either the Church is true, or it is a fraud. There is no middle ground. It is the Church and kingdom of God, or it is nothing” (“Loyalty,” Ensign or Liahona, May 2003, 60). Who stands at the door? And who knocks? What does this imply about who must open the door? What does verse 19 imply one must do to answer the door? When have you felt the Lord spiritually knocking at your door? “With all the strength of my soul I testify that our Heavenly Father loves each one of us. He hears the prayers of humble hearts; He hears our cries for help. … His Son, our Savior and Redeemer, speaks to each of us today: ‘Behold, I stand at the door, and knock: if any man hear my voice, and open the door, I will come in to him’ [Revelation 3:20]. “Will we listen for that knock? Will we hear that voice? Will we open that door to the Lord, that we may receive the help He is so ready to provide? I pray that we will” (“Mrs. Patton—the Story Continues,” Ensign or Liahona, Nov. 2007, 24). Elder Bruce R. McConkie explained that sitting with the Lord on His throne means receiving the blessings of exaltation: “Through [the Atonement of Jesus Christ], all who believe and obey the glorious gospel of God, all who are true and faithful and overcome the world, all who suffer for Christ and his word, all who are chastened and scourged in the Cause of him whose we are﻿—all shall become as their Maker and sit with him on his throne and reign with him forever in everlasting glory” (“The Purifying Power of Gethsemane,” Ensign, May 1985, 9). The book of Revelation begins by focusing the reader on Jesus Christ (see Revelation 1:5–18). How would you summarize what is revealed about Christ in Revelation 1–3? The words directed to the church in Ephesus, “Thou hast left thy first love” (Revelation 2:4), compare the Saints’ covenant relationship with the Lord to the covenant of marriage. How can viewing your relationship with the Savior like a marriage help you be more faithful to Him? Imagine the Lord saying to you, “I know thy works” (Revelation 2:2, 9, 13, 19; 3:1, 8, 15). What parts of your life are you glad He sees, and what parts might you wish He did not see? Conduct a personal inventory of your “works.” Write a personal journal entry listing which of your actions are helping you to come unto Christ, and which actions you need to overcome. Make a list of all the blessings promised to those who overcome (see Revelation 2:7, 11, 17, 26–28; 3:5, 12, 21; 21:7). Pick one or two blessings that are most meaningful to you and study the scriptures on those topics. Then share with someone what you have learned.